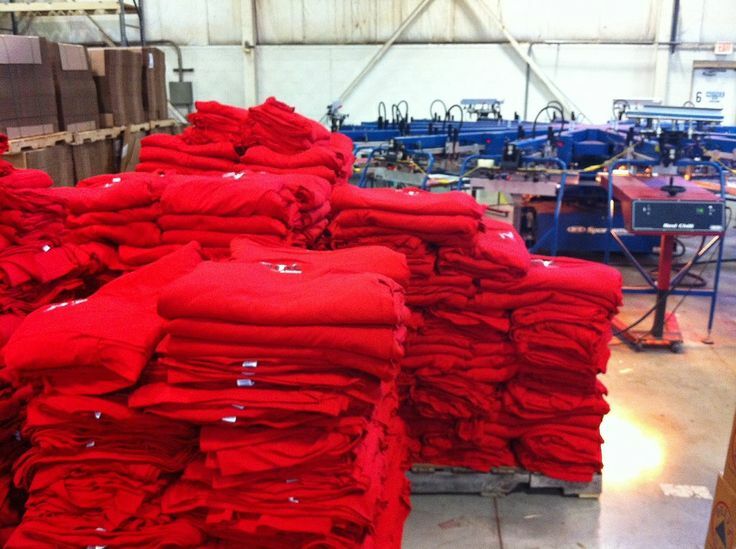 For a lot of shops in the decorated apparel industry, the volume of work that comes into the shop has its ebb and flows based on the markets they serve. The struggle is always to find the balance between having enough people to do the work, and keeping your labor dollars under control during the slower periods of the year. A good way to bridge that gap is to build your staff up using either seasonal workers, meaning ones that are only hired for the three or four months that your shop is busy, or temporary workers, who are people that work for a staffing agency that are called in to help on a very limited basis such as to just work on a particular big order. There are pros and cons on using both, but they can be a valuable tool for your shop when things start to get a little crazy and you need some help. Based on previous year’s order history you can sometimes predict when your shop is going to spike in order volume. You know that the big wave of orders is coming, and you can start staffing and training early for it. Students are great for seasonal workers as they usually aren’t expecting a permanent job anyway. However, regardless of new employee’s background be sure to set crystal clear instructions that the position will end at some point. If you are placing job postings, be sure to add that it is a seasonal position along with the pay rate. As with any new employee, seasonal workers will need to have the basic on-boarding to your company. This includes your company handbook training, safety and hazard communication, as well as general rules about what you allow on the production floor. Be sure to set the tone immediately on the expectations that you have for their work performance. Have your supervisors treat them like any other employee, and maybe set them up with a mentor that can show them the ropes. Sometimes, a seasonal worker may be a relative of a current employee. This can be a blessing or a curse. The new worker has probably heard a lot about your company, your customers, even your management staff. They come “pre-loaded” with their own minds-eye picture of how your company runs based on the stories they’ve already heard. Make sure your leaders treat them with respect and as individuals. If something goes wrong, tread gently and take any challenge discussion off the floor and into an office. There is nothing worse than getting into a family drama when you have to discipline someone’s relative because they caused a problem and now the whole family is in an uproar. When the busy season starts winding down you might consider retaining some of the seasonal workers. A few may have demonstrated a work ethic that you like, or added skills to your company that maybe you didn’t have previously. Be sure to thank the ones that you aren’t permanently hiring, and keep everything on a positive note. Jot down all of their contact information, and find out if they would be available for any upcoming work in the months ahead or even for work next year for the same time. If you do keep a few workers, have a short performance review meeting and discuss both the positive and negative aspects of their role so far with your company. Explain to them why you have decided to keep them, and define their role and discuss a career path that they may have with your company. The goal is to make the transition from seasonal employee to permanent employee as seamless as possible. Using temporary workers from an agency is a great way to add some labor to your staff quickly. Maybe you just have one big order to fill, or someone to do some work like adding hologram stickers to every shirt for a big order. Like any vendor, you need to proactively establish this relationship before you need to call them and place an order. Depending on your location there may or may not be many choices for temporary staffing agencies. These companies are not all built, staffed or run the same way. They have a sometimes shadier reputation, so you need to do your homework with them before you allow one of their workers into your building to help. The good companies to use are very professional in all aspects. If you call around and talk to a few in your area, you will be able to tell easily and the quality of the staff that they send is a reflection on how the company handles their business. They will listen to your needs and discuss with you their thoughts on workers they may place. More often than not, they will not have staff that knows how to print or embroider using your equipment but I have had temps that were trained before. You will need to have a greater degree of hand-holding using temps than using seasonal workers, as these folks will not be your employees. If you use temps for multiple days, you may find that you get a different set of workers the next day and you will have to train them on the work from the very beginning. This can get frustrating for your management and senior staff as they will be asked to repeatedly show people how to do the job. The business relationship is with the staffing agency more than it is with the workers they send to your company. Good agencies will work out a service plan with you, and discuss your basic needs. Rates are generally 1.3 to 1.5 times what you pay an hour for the worker. This means if you pay someone $8 an hour, they are charging 1.3 times that for the worker ($10.40) for the time that they work for you. They will have their own method of keeping track of their time, but it is usually a timesheet or spreadsheet that you turn in at the end of the shift. Temp workers can be frustrating to have on the floor, and over the years I’ve seen a lot of really bad workers get sent in for the day. The best thing you can do is to call the agency and send them home. Be sure to give reasons why, and get their name so they don’t come back in the future. Percentage wise, I’d say that 10%-15% of the temps we’ve used were excellent and we would hire them in a heartbeat. 15%-75% were good workers and did the job adequately without a problem. Another 10% are workers that are low performers, and if you keep an eye on them they can do ok. The last 5% are the folks that have been big problems. These are the people we’ve had to send home, couldn’t perform, or had issues with their work habits. As temp agencies have to fill their orders with their pool of workers available at the moment you call, there’s no way of telling what you may get when you place the order. That’s why it is very important to discuss what happens if you are not satisfied with the worker performance. Is there a guarantee? Will they replace the worker? Do they credit you for the time lost due to problem with their person? Get this understanding out of the way, and in writing, before there is an issue. Your supervisors and team leaders have to keep an eye on temp workers during the day. The temps may not know how to do something, your quality control expectations, your shop culture, and general rules about working at your company. Temps will look to your employees for guidance and training. If you put these folks with more seasoned veterans, you will usually get better performance than if you put them with less skilled employees. Your veterans probably train your own staff, so they are used to showing people how to do things and give verbal instructions. Before bringing on any temps, be sure as to who is going to supervise or train them in their tasks. Temps are sometimes available for overtime or to only work a four hour half day. Work that out in advance as well, and don’t forget that if you are paying for overtime for a temp it isn’t on the base rate…but on the higher temp rate. It gets costly quick. Whether you use seasonal staff or temporary workers from an agency, one thing is certain and that is that you need a plan of action for supervision and training. I have found it best to have one person in charge of organizing these new people and getting them set up in their tasks. It is much easier if they know who to report to when they check in at the beginning of the shift. Audit their work occasionally to ensure top quality performance, and make a point to show them the “tricks of the trade” on how to do the tasks easier and with more confidence. There are many things about our industry that we take for granted every day as we’ve been doing them for so long. The ergonomics of simply working with a repetitive motion such as pulling shirts off a machine, how to count shirts and fold them into a dozen, and what quality control measures or items that should be checked are all examples of some things you could teach someone. Usually, the work performed is a direct reflection of the quality of the training given to the person.